Novinger’s Inc in Harrisburg PA is a premier specialty contractor primarily serving Pennsylvania and several bordering states. Although the majority of our current work consists of fabricating exterior wall panels and applying fireproofing material, we also do structural framing, hang drywall, and install ceilings. Our talented union carpenters, plasterers, laborers, tenders, and finishers work as a team to deliver superior quality work. 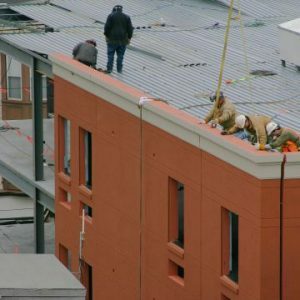 Our objective is to exceed customer expectations in all aspects of a construction project – from submitting a fair estimate, complying with all contract requirements, cooperating with other trades, providing a safe work environment, honest billing, and ensuring that each project is completed on time and on budget. Building strong customer relationships is important to us. While we welcome the opportunity to work with new customers, we are often asked to bid on new projects with existing satisfied customers. Our firm has been in business for more than eight decades and we have observed many changes in materials, methods of construction, market conditions, and contract terms. One thing remains the same – Novinger’s Inc in Harrisburg PA still delivers quality products and craftsmanship to every project. We have the people, resources, and experience that are required for each project. December 2018 – Novinger’s Inc will be installing metal stud walls, drywall, and acoustical ceilings for a tenant fit-out project in Harrisburg, PA. We have also been selected to do the spray fireproofing on a new UPMC Pinnacle Hospital project in York, PA. The new hospital will be 220,000 sq. ft. with a three-story medical office building to be completed by late 2019. November 2018 – Our spray fireproofing crew is almost done at the new Geisinger St Luke’s Hospital project. This is a three-story, 120,000 sq. ft. facility in Orwigsburg, PA.
October 2018 – Our panel installation crew is finishing the installation of EIFS panels on the Chester County Hospital expansion project in West Chester, PA. Almost all panels are hung and caulking is underway. Now that the building envelope is enclosed, the interior work is on target to be completed by early 2020.